This spring has been amazing in the Pacific Northwest. It’s been warmer and sunnier than usual. I’d taken some time away from events after being on the “one or more per month” routine for the past three years. That was good too – we’d had lots going on at home. 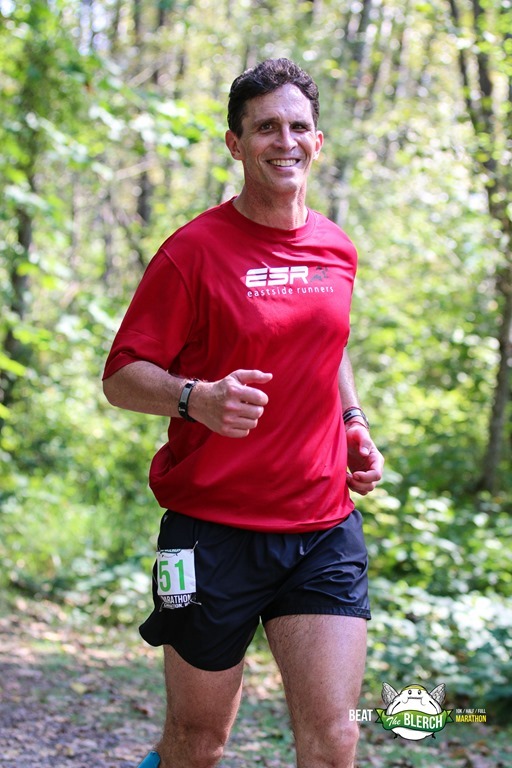 The first weekend in March brought me out to do the Spring Run for Fun @ the Watershed – a nice event put on by Northwest Trail Runs. I’d done this one three times before, with a pretty broad range of finish times. I’d not done good marathon training this year – my last 20+ miler had been six weeks before. I’m used to doing these every 2-3 weeks. I was a bit nervous about how things would go. As always, there were lots of friends out at the start. It was chilly – high thirties – when we lined up. Last year had been even colder, and also wet. Today promised to be a nice day for running. So long as I suppressed my inner whinging, I had little excuse not to enjoy the miles. 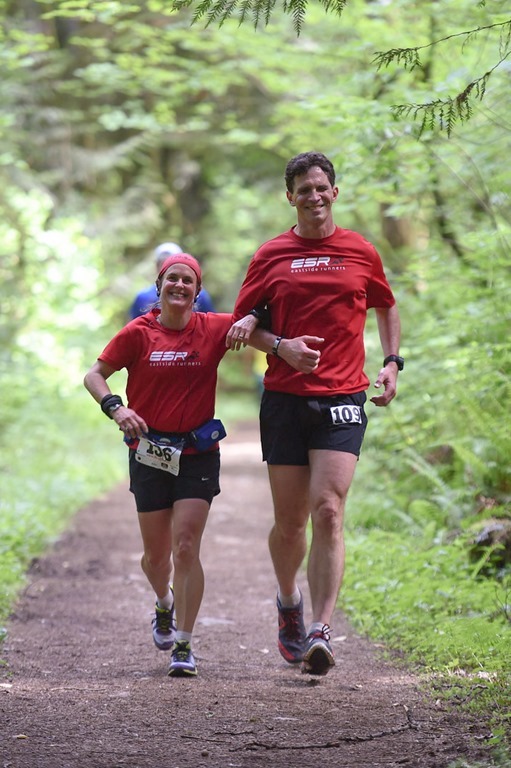 My race plan was simple – try to keep my heart rate low-ish. I started out faster than I probably should have. My splits and average heart rate looked fine, but my respiration rate felt faster than I’d like. It took me the first 6 1/2 mile loop to settle down a bit. Several miles in, I started walking a minute every mile or so, to help keep my late mile pace steadier. I didn’t let myself walk much outside of the set walking breaks, even on the short climbs. I just kept plodding along. I used to do this all the time, but have gotten a bit more lax on trails than I’d like. As you’d expect, this got more challenging in the late miles, but it felt good to push myself like this. I would see friends on the out and back sections of each loop. As we got farther into the race, the smiles would turn into faces of quiet determination. Today I just needed some silent time, so I ran the race solo. Six miles became thirteen, then nineteen. Before long I was at the last aid station, around mile twenty-three. I was just a short training run from done. My legs were tired, but I felt better than I’d expected after my scant training. Going around the top of the preserve, along Collin Creek, then to Trillium, I stayed in the present, enjoying the miles. Those last few short climbs were tough, but I knew I’d be fine. I crossed the finish about fifteen minutes faster than I had last year – just under 4:27. This was still pretty far off of my personal best on the course (3:58), but I was pretty happy with my effort and my results. Not sure what is going to be next up for me – but I’ll want to get more quality miles in between now and then. My 6.55 mile lap splits trended up – 9 min positive split (62 vs 71) between lap 1 and 4 – no graph needed. It’s a negative split that is often an indicator of a race smartly run. Lesson learned – again . what’s a wattle between friends? There’s a tradition here in the northwest marathoning community. On Thanksgiving weekend, some crazy people run four marathons in four days. The most socially-acceptable name for this is the “Quadzilla”. I’m not completely sure of the origin, but it’s since expanded to numerous other places as well. Marathon Maniacs do this for at least two reasons : it’s fun, and you get to earn six maniac ‘stars’ by completing this feat. I, on the other hand am not quite so ambitious. I’ve done a “bi-zilla” before (just made that one up), but not four of ‘em. But spending Thanksgiving morning running with several hundred friends is a great way to celebrate the holiday. 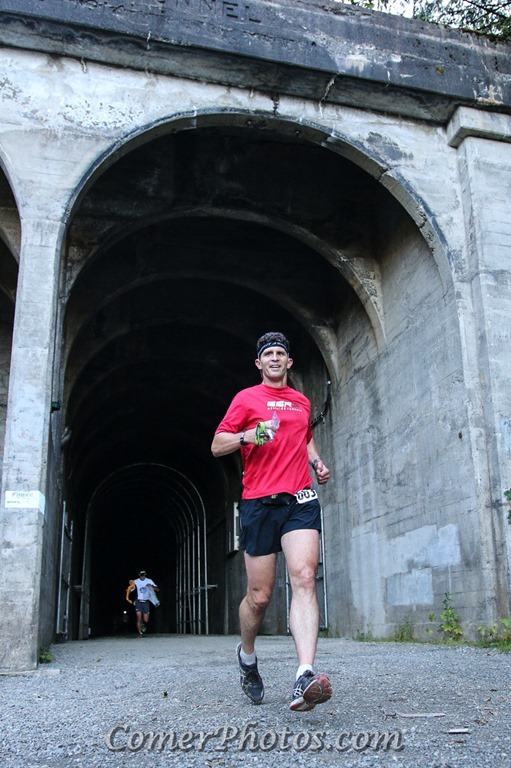 My race plan was simple – try to come in under 4 hours, and keep it fun. So I was a bit puzzled when I started clicking off mile splits that were a good 30-45 seconds faster than I should have. Each time, I’d take it back a notch but find myself speeding up again. After a while I decided to see what would happen. I briefly entertained the idea of hitting another sub 3:40 marathon. That would have been something to celebrate. Over time the splits got slower. Gradually reality set in. By the time I passed through Gasworks Park again, heading out towards Ballard, it was looking more like a sub 3:50 was more reasonable. I came in at 3:47:04, and was pretty happy with it. Big thanks go to Matt and Betsy for putting this nice event on – it’s a great way to start Thanksgiving. I’d had lots going on this month. There had been some unpleasant stuff going on with work, and I was feeling like I was at a crossroads. Real life was busy too, looking at colleges with our eldest daughter. Lots to think about. 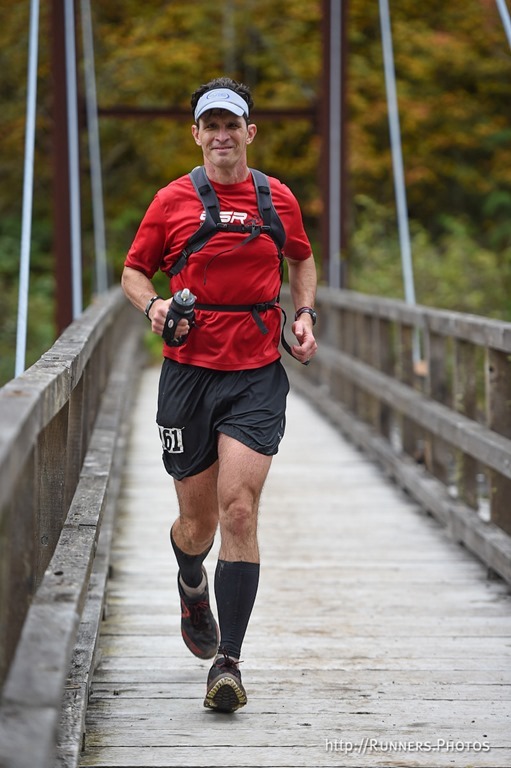 The good news was that I had plans to run the Baker Lake 50k. This event put on by Terry Sentinella had been on my list for several years. 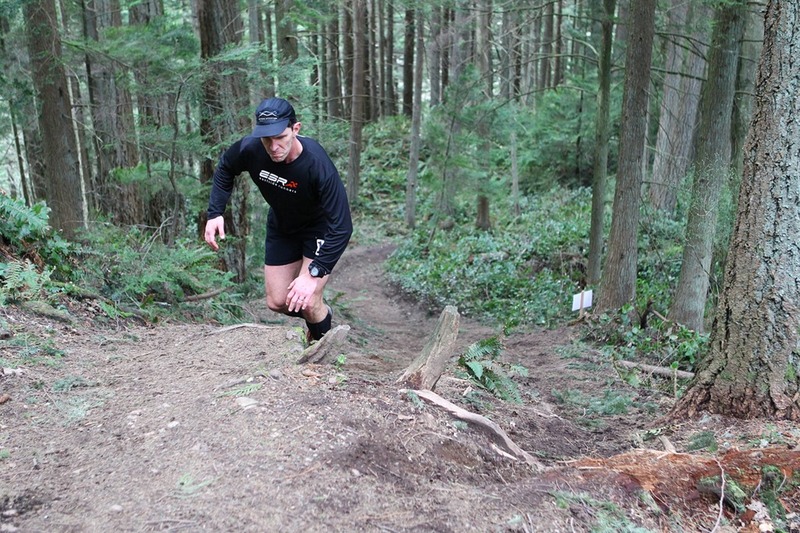 The course rolled through the the woods along the lake, in the shadow of its namesake Mount Baker. Stirred up by some of the stress I’d been carrying, I didn’t sleep well the night before. Morning came earlier than usual – after a simple breakfast, I started the hour-long drive to the start. Thankful that the race was a small, low-key event – I relaxed a bit on the way. I was confident about covering the distance, although this would be my longest run since late July’s White River 50 miler. The day’s run would mostly be a retreat of sorts, a chance to step back and get some needed perspective on things. We started on time under an overcast sky. We wended our way up over the dam, and embarked on the trail that would take us out 14 miles to the turnaround. Three miles in, we crossed a creek along a big log put in by the forest service. We were about ten to twelve feet above the creekbed. It was kind of fun on the way out, but much more interesting on the way back when my balance didn’t feel quite as sure. The first of only two aid stations was at mile 5.5. Simple, but functional – it was self-serve, water-only. I took a minute to top off my bottle before continuing on. As we rolled through hills, we sometimes ran along a steep dropoff of several hundred feet into the lake. The roots and rocks kept me paying careful attention to the trail in front of me. But around mile 10, my mind had drifted a bit, and I took a hard spill, bruising my ribs and right quad. Along the way, I managed to turn both ankles a bit too – making any lateral movement on these joints painful. I’d feel this the rest of the way, but plodded on. I reached the turnaround at Hidden Creek almost exactly three hours in. I was pretty sure that the trip back would be slower, so didn’t feel pressure to work under the six hour mark. This was the second of the two aid stations, and it would be ten miles before I got back to the other one. I drank a bunch of fluids, and ate a bit before headed back. I wasn’t going fast, but I felt pretty good. I felt more calm than I had in a while, and just took it in. This was the goal for today – relax and enjoy the miles. Right around mile 22, a group of three overtook me. The young woman running in front apparently felt pretty intense about the run. Each time we’d approach a climb, she’d grunt out loud. On the downhills she’d growl. It was interesting. I was okay with it when they passed me at the aid station with 5.5 miles to go. While there, she picked up one of the gallon water jugs and chugged directly from it. I didn’t see whether she finished all of it, or simply put it back for others to share. You don’t see that happen too often. The final two miles were tough. I’d reached the point of counting down, and was ready to be done. As we exited the trail with about a mile and a half to go, I fell into a nice conversation with a woman named Simone, who shared a story about her grandchild, and how she finishes each race with a cartwheel (yes she does). It was a nice pick-me-up as we crossed over the dam, and headed back towards the finish. I crossed the line just under six and a half hours. I rested for a short time at the finish, then changed into some dry clothes and headed back to Burlington for some crab shooters and brisket. I’ve been running distance for years now, and still haven’t quite figured out how to carry over lessons learned on the trail into real life. Can’t stress about things we don’t control, just work on making the things we do control or influence better. My pattern in recent years has been towards smaller events, low overhead, and low key. 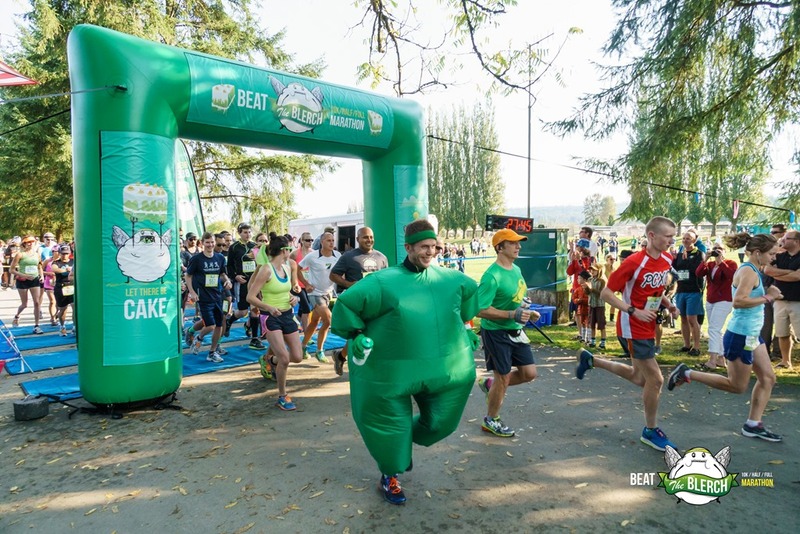 So back in March when The Oatmeal announced that he was going to put on the inaugural Beat the Blerch Marathon (along with the Half and 10k events), I wasn’t sure I wanted to brave the crowds to register. It was Kris’ fault that I did. Five minutes before registration started she texted me saying “could you register me for the Blerch thing too?”. After twenty five minutes of refreshing non-responsive web pages, and retrying I thought I’d gotten both of us in. Turned out they bumped her, and then I was left with a registration that I felt sort of ‘meh’ about. Sunk cost. Damn. When race week rolled around, I was one week off of a new PR. 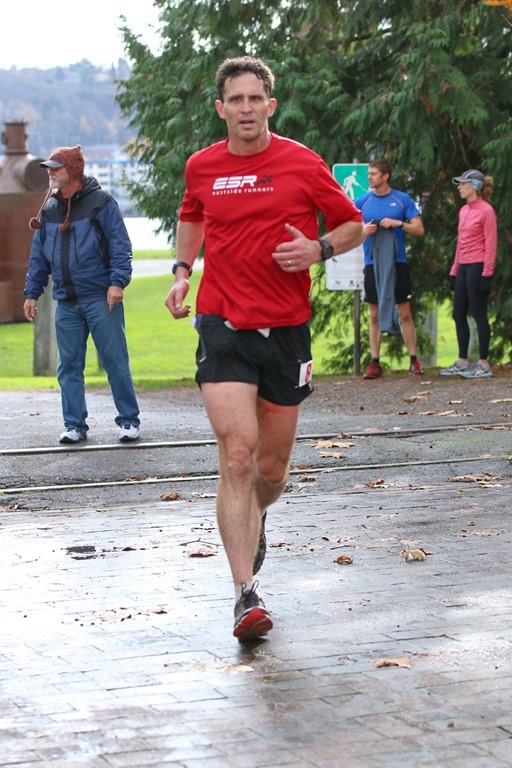 I was still soaking that one in – a new PR at age 49. Made me wonder what kind of self-imposed ceiling I’d been working under in the sixteen years I’d been doing marathons. Think about it. How often do we assume a perceived limitation is real? So legs tired, and spirit still reveling in that new PR, I lined up with the costumed crew at the start on a foggy morning in Carnation. It had been a very tough week at work, which made it even more of a grind. I kept a steady sub 8:40 pace for the first 9 or so miles. I was unaware of the slight uphill grade on the way out, so didn’t plan accordingly. The smart thing to do, especially given the fatigue I still felt from the week before would have been to go out verry easily. By the time I hit the halfway point, it was too late. I was clicking off consistent sub 9 splits, but didn’t feel good about being able to keep that up in the second half. By the time I came back through mile 15 and 17, I pretty well toasted. This stretch passes by a firing range in the distance – so the sound effects were an apt metaphor for how I felt – like I was being assassinated – albeit slowly. At mile 22, I began walking more. My sub-four goal went out the window. But along the way, despite me feeling done, I appreciated the silly vibe the race had going. Not my best day running, but a fun event nonetheless. I came in just under 4:15, just under my time for my first marathon, sixteen years ago. Having had some time to reflect on the race now, I’m not sure I would do this one again. It’s too big, and the hassle factor was a bit much for me. On the other hand, race day was fun – it was great seeing many first timers out there taking on the Blerch. I’ve run all of my events on trails this year. And seven of eight of them had been ultras. But when my wife Kris qualified for Boston several months back, I got the itch to try doing a fast marathon again, just to see whether I could qualify, or even get close. Another reason to shake things up is that I’ve struggled a bit with motivation in recent months. This is why when we were at a birthday party for a friend last month, I excused myself to register for the Tunnel Lite Marathon. When all the other guests were enjoying cocktails and food, Kris and I were huddled to the side with our smartphones entering our info. This event starts just east of the Snoqualmie Tunnel, near the pass. We run downhill into North Bend, most of the way on a nice railroad grade, through the mountains. It’s quite beautiful, and it’s an excellent route to attempt a Boston Qualifier (BQ) as well. I was confident that I could cover the distance. I’d done adequate weekly mileage, and some good long runs. But it would have been better to actually do some intervals, mile repeats, and tempo work to prepare. You know, actually train? But as is often the case, things got busy. One downside of being on the marathon or ultra per month plan, as I’ve been for nearly three years, is that it’s a veritable treadmill. 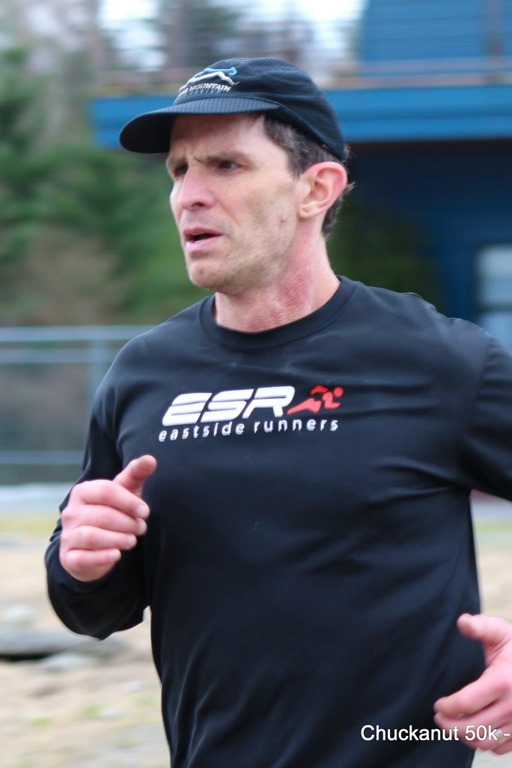 Other than the White River 50 miler, I’m usually pretty well trained to cover the distance, so I tend to get lazy about strength and speedwork. Back before I started doing these marathons and ultras so often, I’d focus on One Race for months. I’d do more structured workouts, knowing each day whether I was doing long slow distance, speedwork, or recovery pace. So when I lined up at the start, I had no idea what I’d get. I’d fly a bit blind too, since the band on my GPS watch had broken – I wouldn’t have a way to check my pace easily. Turned out that there weren’t mile markers until mile 14 here, so I really had no idea how I was doing. 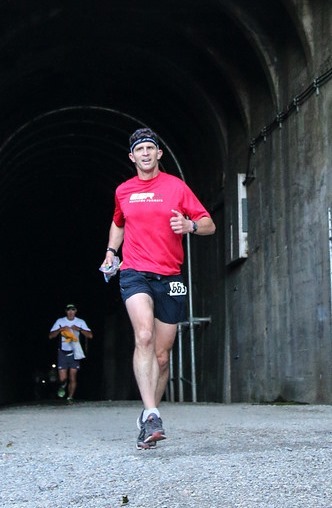 When we ran those two early miles in the dark through the Snoqualmie Tunnel, it really was a fitting metaphor for my race plan. I kept my eyes straight ahead towards the light, and tried to keep a steady turnover. Exiting the tunnel, I doffed my headlamp and began the trek downhill. We were on a steady (railroad grade) descent for most of the course, with the bulk of this happening over the first 21 miles. It’s kind of like running with the wind at your back, until your legs get trashed from the pounding. I paid more attention to form than I usually do – low glide, slight forward lean, and engaging my core as best I could not having done any actual core work in forever. It helped. I started feeling the wear in my legs around mile 8 or 9. At the same time, I wanted to see what I might have in me. This course can do that to you. I glanced at my watch when I reached halfway. I’d run a respectable road half marathon pace. If I could maintain the pace, I’d PR or maybe even BQ. Now things got harder. We wound through the trees, over the beautiful bridges. I’d run this part several times before. I remembered coming around the corner near Rattlesnake Lake, feeling like I could fly. I also remembered my wheels coming off after taking this part too hard several years back, and having to walk most of mile 25-26. When we leveled out a bit by Rattlesnake Lake, I gave myself permission to ease up a bit. By now we had mile markers, so I was taking my splits. I was hovering around 8 min/mile, sometimes less, not often too much more. I’d need to keep under about 9 min/mile in order to PR. Some quick math told me that a BQ would require pushing under 8’s for the duration. And this is where things get interesting. I sort of told myself “I can’t”, lacking confidence in my training. It might not have been realistic, but I have to wonder what would have happened if I’d not been doing the math. I might have pushed myself so hard I had to walk. By now my hamstrings had spasms, and I was worried about that. On the other hand, maybe I checked out a bit too soon, thinking that the BQ was out of reach. Ultimately I missed the BQ by about 5 seconds per mile. Realistically, I could have made this up by slowing down a tad in the early miles, so that I had enough left to push a negative split. I lost about five minutes in the second half. I’ll never know, but it’s good food for thought. Those final five miles were tough ones. I held together pretty well until mile 25, when I walked a bit. My hamstrings were starting to cramp, it was getting warm. 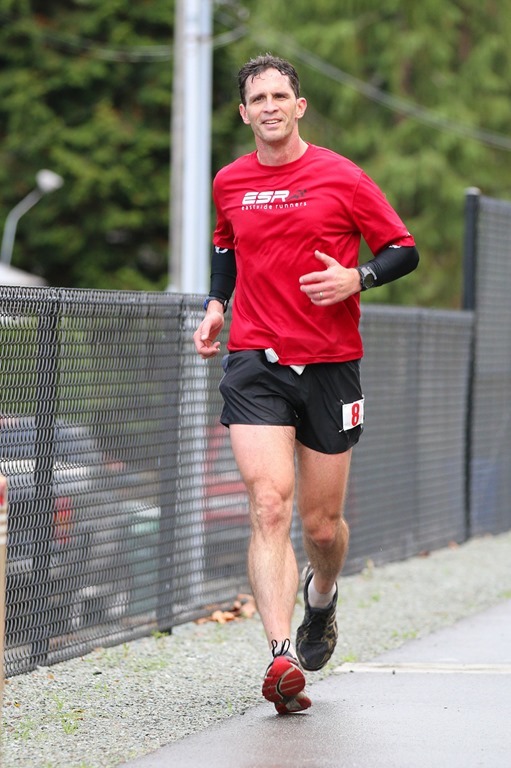 I crossed the finish in 3:31:54, over seven minutes faster than my previous PR. This was one of those days I went out and surprised myself. I got better than the race I’d trained for. 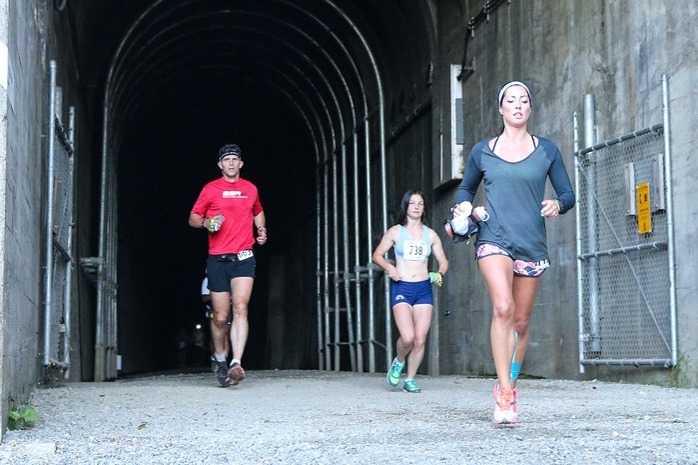 Next time I run down from the Tunnel, I might prepare more for it – would be interesting to see what that gets me. This is the pace chart, taken from my Suunto Ambit. I don’t place much faith in it telling me that my peak was a 4:41, nor that my fastest mile was a 5:04. I think it more likely that I peaked just under 7, and my fastest mile may have been around 7-ish. Given that the late miles were all over 8 min/mile according to my watch (slowest was 10), I must have done a goodly number of sub-8 miles early on. First half was about 1:43:26. That means the second was about 1:48:28, a positive split of five minutes. Strength and speed work are the best way to address that. It’ll be interesting to see whether being sooo close to a BQ motivates me to actually do that. Once in a while, we have the good fortune to be reminded about why we love doing what we do. That was what doing the Redmond Watershed Twelve Hour event was for me. I’d done this run the previous two years. The shift to time verses a set course length makes it much more about running your own race. People settle into it, and have fun. My original goal this year was to cover 50 miles. That shouldn’t be a problem, right. You can almost walk that far in twelve hours, right? The problem with this was that I’d not really built the proper mileage base. 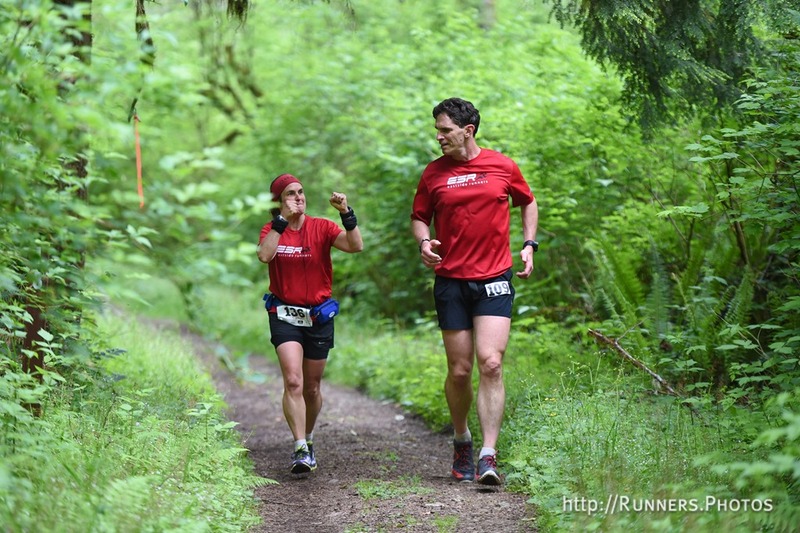 I could confidently do 50k, but 50 miles? Also, I’d just gotten back from a business trip to Chile the day before, and was feeling a bit like I’d run back from Santiago. So the plan changed to a 50k training run with friends. And that’s what we did. What made it even better was that my wife Kris and I were celebrating our 20th anniversary with this jaunt in the woods. In preparation for the Light at the End of the Tunnel, coming up in July, her day would be a 20 miler. We almost never get to run together. And what made this venue great was that there was no time pressure at all – we just needed to keep moving. We ran with friends too. 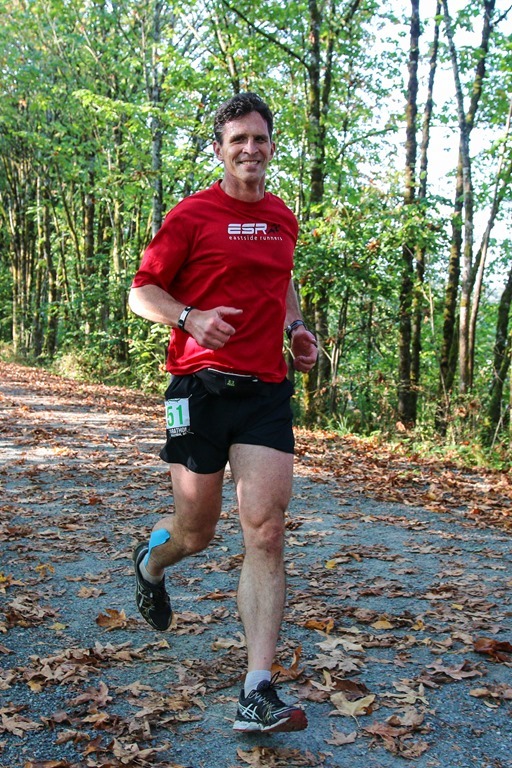 A bunch of the Eastside Runners crowd was out there, as were several folks I’d met doing local trail ultras. We spent the time sharing stories, debating fine points of runner’s etiquette, and sometimes just enjoying some quiet time in the woods. This is what the race was about for me – enjoying time with friends (including my best friend), while getting some time on my legs. 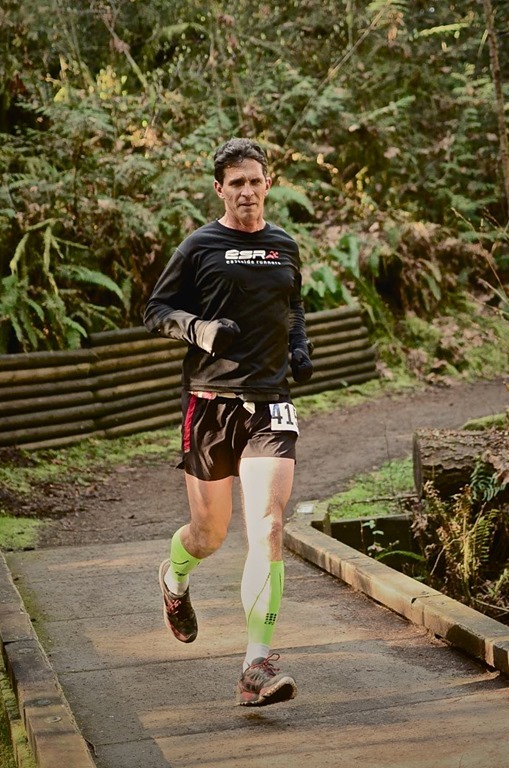 The Chuckanut 50k is a northwest favorite. It usually draws a good field, and the course has a bit of everything. The scenery feeds your heart, but parts of the course might make your soul cry a bit. There is over 5000’ of ascent and descent – which you will remember when you’re trying to take that final flat 10k fast. climbing up the chinscraper – photo courtesy of Glenn Tachiyama (http://www.tachifoto.net/). 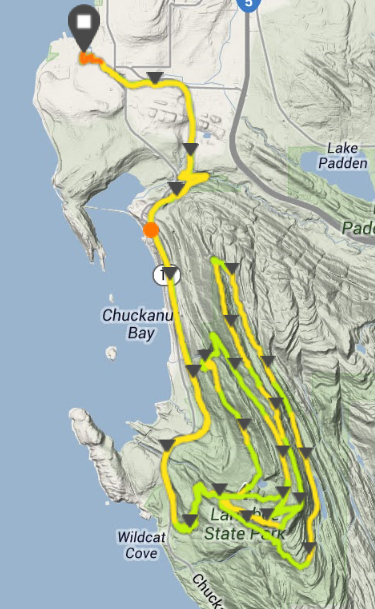 I’d signed up for Chuckanut on kind of a whim, thinking it would be a great stepping stone on my to longer runs. Drove up Friday afternoon, glad that I was staying about five minutes from the start. It was nice to coast over about 30 minutes before the start, without a worry. They sent us off at eight on the dot, all 400 of us packed into the narrow interurban trail leaving Fairhaven. As we set off, I got to see a bunch of familiar faces – Chrissie out there doing her first 50k (just three weeks after breaking her tailbone! 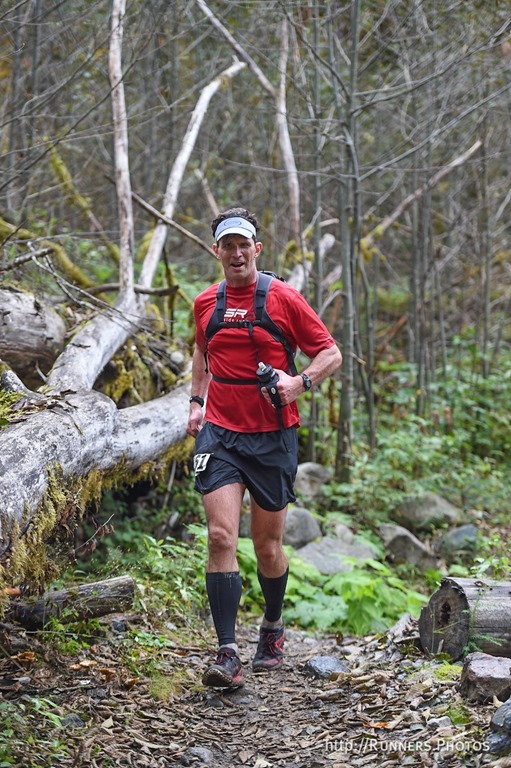 ), Gunnar from work – intense and focused on the trail as he is at work. I chatted with Barb and Lisa during that first stretch too. 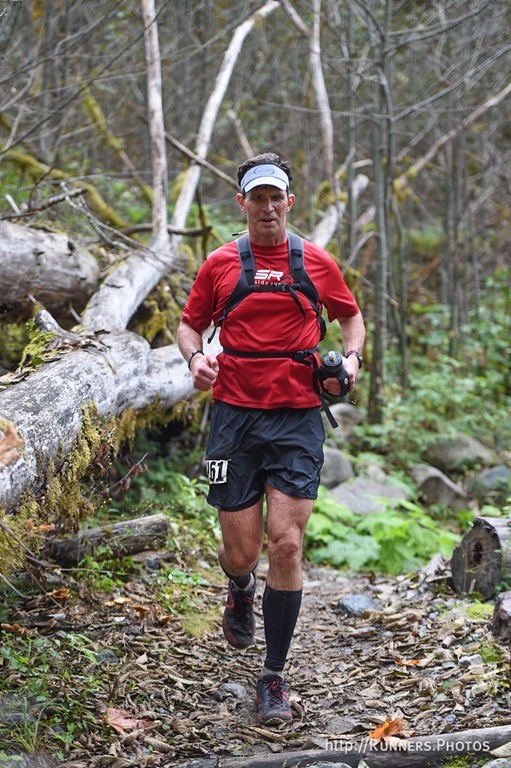 By the time we reached the first aid station, the pack had spread out quite a bit – which made the single track climb that followed much more relaxed. I settled into a steady walk (up the hills) and easy run (on the more level or downhill parts), knowing we had some hard miles ahead. The hardest part of the course for me is the three mile stretch up Cleator. Two years back, this had been an icy slog. This time was much easier – we’d been blessed with great weather. I reminded myself to be patient, but was very happy when we made the turn on to the Chuckanut Ridge Trail, around mile 13.1. This is possibly one of the more fun places to run in this part of the country. We run along a fairly narrow ridge, nestled between a long drop on the right, and one that would involve less-than-fatal injuries on the left. Even those of us who don’t like heights will find this scramble liberating. You focus on getting your footing right, while trying to enjoy the view along the way. The run along the ridge, and then back on the Lost Lake trail reminded me why I was out there. Along the way I thought about my friend who’d wanted to be out there, but was ill. We’d shared some miles, and stories together. I hoped he’d be out on the trails again soon – things had been tough for him lately. When we came to the base of the climb to the Chinscraper, I was tired, but felt pretty relaxed about what was ahead of me. The climb was longer than I remembered, with the steeper parts slowing me to over a 20 min/mile pace. When I reached the final climb, I pushed hard – making up this time without having to use my hands to help. Better than last time – felt good, but I definitely paid for it on the long steep downhill that followed. And it was sorely tempting to pound down those hills. But having done this once before, I remembered having spent my legs doing this last time. So I downshifted and hoped I’d have something left during the final 10k. I wouldn’t have guessed that my fastest mile splits would come so late. I was on the edge of losing faith, but somehow managed to keep moving. Each mile got a bit faster than the last. Down below 10, 9:30, 9, then below 8:30. It didn’t feel fast, just hard. But it was great to keep moving. Rounding the final turns before coming out into the open air I was able to dig even a bit deeper. 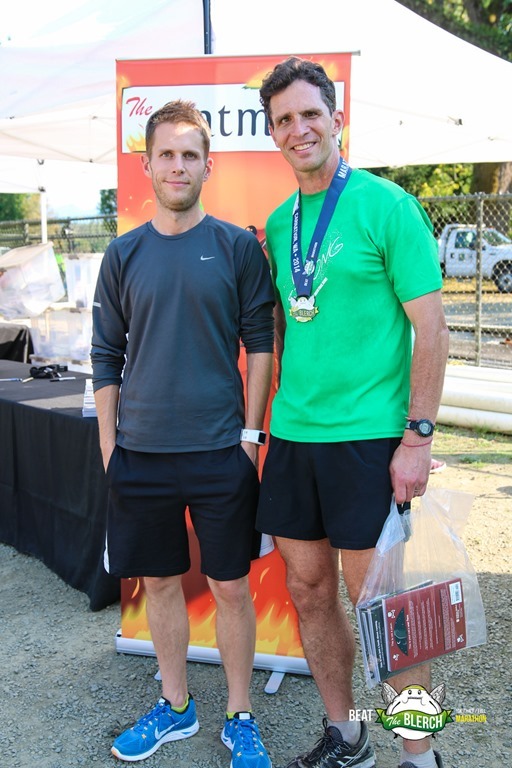 I crossed the finish in just under 6:22 (chip time), and felt better about my effort than other recent events. I put on some dry clothes, enjoyed some wonderful lentil soup, and watched some friends finish. The splits mostly reflect the course topology, but comparing the first and last 10k makes me feel good. By the orange line (indicating pace) you can see that there was a bit of walking involved.